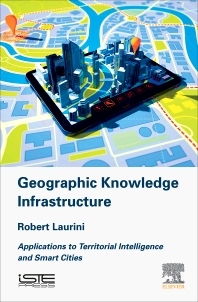 Geographic Knowledge Engineering: Applications to Territorial Intelligence and Smart Cities studies the specific nature of geographic knowledge and the structure of geographic knowledge bases. Geographic relations, ontologies, gazetteers and rules are detailed as the basic components of such bases, and these rules are defined to develop our understanding of the mechanisms of geographic reasoning. The book examines various problems linked to geovisualization, chorems, visual querying and interoperability to shape knowledge infrastructure for smart governance. 2.7 Conclusion: what is special for geographic knowledge? Robert Laurini is a world-renowned specialist in geographic information systems on which he has written several books and more than 200 papers. His research focuses on geographic knowledge and rule engineering for smart cities and territorial intelligence.